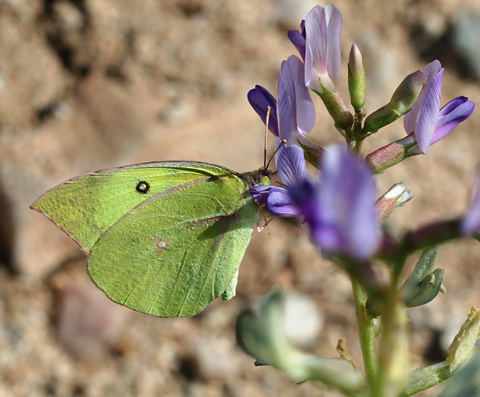 For me, my annual first day of spring here in Tucson always begins when I photograph either my first butterfly or my first wildflower of the new year. 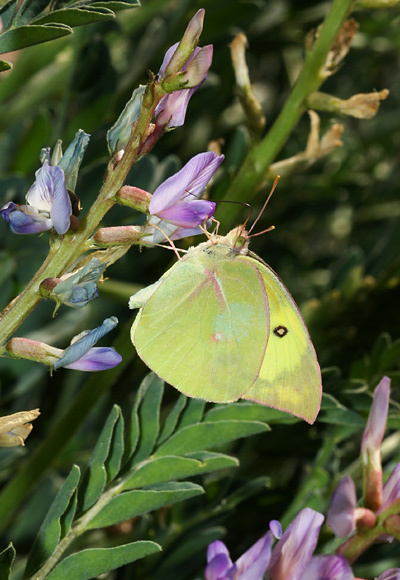 On February 17, 2007 here in Tucson, I managed to photograph both of them together, a Southern Dogface (Zerene cesonia) butterfly on a blooming Milkvetch (Astragalus sp.) plant. Southern Dogface butterflies are so named for the yellow dog's head marking surrounded by black on each of their dorsal forewings (not visible here). Their ventral wing surfaces are yellow with a small, black-ringed spot on each forewing and either one or two small, brown to pink-ringed spots on each hindwing. 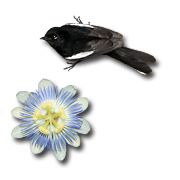 The forewings are point-tipped and can either be straight-edged to slightly hooked as with this Southern Dogface. Southern Dogface caterpillars feed on plants in the Pea Family (Fabaceae), which would include plant species in the genus Astragalus like this flowering Milkvetch. A number of Astragalus species are poisonous because they either accumulate nitrogen or selenium from the soil or contain high levels of the alkaloid swainsonine which causes locoweed poisoning or locoism. Not knowing the exact species, I don't know if this Milkvetch is one of the poisonous ones… Or even if Southern Dogface caterpillars would mind if it were poisonous given that their insect metabolism is very different from that of a susceptible animal like a horse or other mammal.